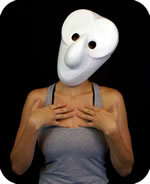 Theatre-Masks.com provides masks to professional theatres, individual artists, and educational institutions worldwide. There is no other mask studio that places as much attention to top-quality, professional-grade materials; sophistication of sculpture; fair pricing; and customer service. 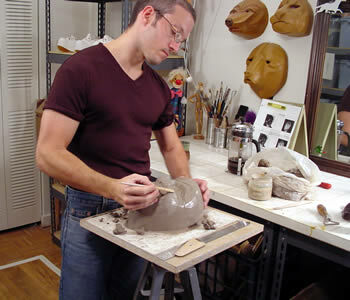 The masks made by master mask maker Jonathan Becker are living form or also referred to as expressive form. They appear to change expression as the body moves underneath them or as they are moved through space. 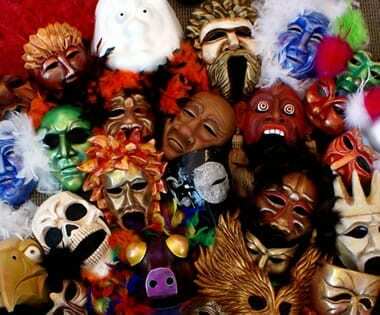 Our most popular masks are designed for the Commedia Dell’Arte. Consisting of stock comedic characters such as Arlechino and Pantelone, they have great significance, each with a rich history and story behind it. Commedia Masks are often used in actor training, focusing on the connection between movement and expression. Our Commedia Dell’Arte Masks are based in the historical forms, but lean toward a more modern sculptural style. These Character masks and character half masks have been designed for both classroom use and for professional touring companies. The character masks are based very strongly in particular passions (rage, fear, jealousy etc.). For actor training the masks are great for encouraging an understanding of action and play. The full-face character masks lend themselves to a pure play of action and the character half masks allow for the use of text. The neutral theatre masks are intended mainly for the training of actors. The neutral mask leads the actor toward a state of alert availability and an understanding of discovery, economy of movement and presence. It is a mask that is most strongly connected to the teaching methods developed by Jacques Lecoq. Neutral masks from the studio are currently being used in many of the top training programs. Masks were an essential part of the Greek Theatre. Masks in the Greek Theatre provided means of transformation. The Greek actor was able to put on a second face and transcend everyday life taking on a theatrical persona. Our masks have been created over the years for a variety of plays and have been based loosely on ancient designs. Our Greek Masks are a three-quarter mask, covering the face except for the mouth. The comedy tragedy masks originate in the Greek Theatre. They have come to symbolize drama in the western world. We have both decorative and wearable Comedy Tragedy masks. Mardi Gras, the Carnival of the Americas, is the largest masked party on the continent. Mardi Gras has its origins in the mix of the French and African cultures of New Orleans. Like carnival, Mardi Gras begins of “Fat Tuesday” and ends with the beginning of Lent. Our Mardi Gras masks are of the highest quality and intended to inspire mystery and celebration. The predesigned individual masks and masks for shows have been created specifically for scripted works where masks are the central part of the theatrical event. Masks are available for Aesop’s Fables, James and the Giant Peach, Jack or the Submission, and others. This is an area of the site where animal masks and Greek masks are in abundance. These Larval Masks are based on the Carnival masks of Ball, Switzerland. They oversized and abstract, representing a character of sorts that is in it’s very early stage of intellectual development. Each of the masks is caught in a very simple state of naiveté. The world looms large and unsolvable for these masks. Wear one and humor ensues! Jonathan Becker is a mask maker, teaching artist and performer. He began sculpting masks in 1986 while a student in Paris, France and founded Theater-Masks.com in 1990 upon his return to the United States. Clients include Disney Theatrical in association with The Lion King, The Bravo Cable Network and Theater of Enchantment in Philadelphia. Jonathan has created hundreds of masks for theatre companies, producing organizations, individual artists and training programs in over 45 countries.